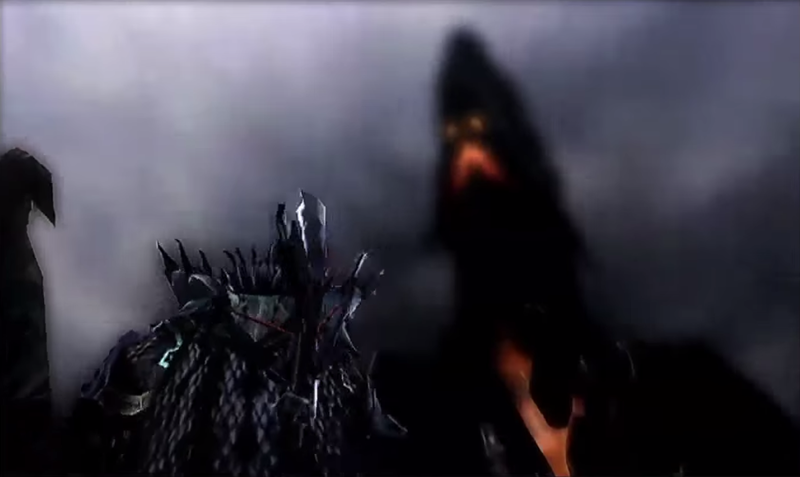 This monster is the online final boss in Monster Hunter 4 Ultimate, and it’s an interesting one. The Gogmazios, which I also call Gogu or Oily, is the final boss for the online mode in Monster Hunter 4 Ultimate. It’s a giant, black elder dragon that can only be fought in the Town, meaning you have a whole arsenal of weapons at your disposal. 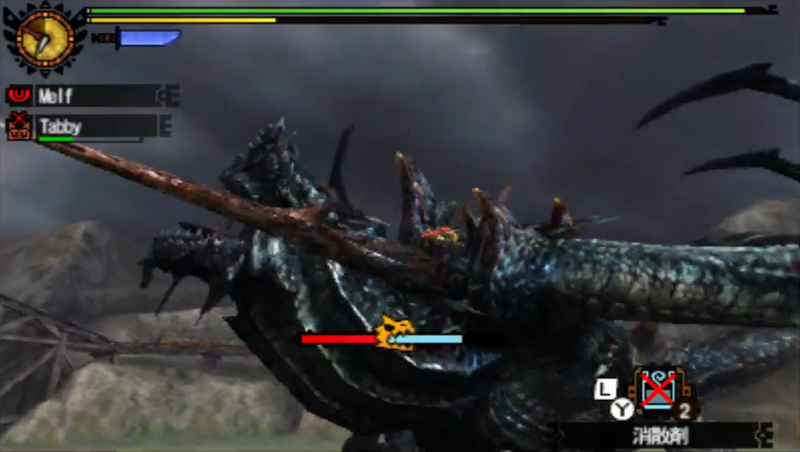 It looks, to me at least, like an overgrown, skeletal Gore Magala, and some of its moves remind me of Gore as well. I really can’t wait till this game releases in English next month so we can find out exactly what it is, and the lore behind it. Being fought in the Town, you have a bunch of weapons to use against it. There are ballistae, cannon balls, a dragonator, ballista binder and a giant cannon. There’s a large brown scorch mark in the middle of the area in which Gogu is fought; this is where the ball from the giant cannon lands, and it will do a ton of damage if you manage to land it. The cannon is fired by putting in a coin, which can only be done once per person per hunt. Before I get into its attacks, I want to touch on its breakable parts. Its chest is split into two areas, a top and a bottom, which break separately. Its face and wings are breakable, and its tail can be cut. The back breaks as well, and it’s well worth continuing to attacks its back after it first shatters, because something really cool will happen. You may have noticed that Gogu has a massive spike on its back. If you keep hitting its back after the initial break, this spike will come off and can be utilised as a one-use dragonator. Yep, that’s right – hit the back enough, and you fire its own spike back into it for a ton of damage! The end of the spike just sort of falls out, so Gogu has to be basically standing on it for it to work. But that’s definitely possible, and my partner and I have done it a number of times over a number of different hunts. After the spike comes off, riding the monster will put you on its chest, giving you an opportunity to break that. A successful ride will, as usual, make the monster fall over. Gogu takes a few seconds to drop and always falls on its left side, so bear that in mind when it’s about to fall over if you want to hit a certain part of it. Gogu introduces a new status ailment: Oil. It works just like the web utilised by the Nerscylla and its subspecies. If you get caught in it, you can either button mash or use a cleanser to get out of it. While you’re stuck, you won’t be able to move, and as such are more susceptible to attack. Oil drips from this monster’s body as you fight it, stays on the ground for a few seconds and then fades away. It can also pause and shake itself, causing oil to fly off its body and all over the place. This monster is brilliantly designed in that it was intended to be gross, and it is; walking up to its face when it’s down will allow you to see, in detail, the oil oozing down its face between its spikes. Just thinking about it as I write this makes me shudder. Gogu can fire beams of oil at hunters. It has one which simply fires out directly in front of it. There’s another which sees it bring its back back for a second before doing a sweeping beam of oil across the map, which does quite a bit of damage. Neither of these attacks inflict the oil status effect. Gogmazios has a third oil beam which comes out orange. It focuses the beam on a single point on the ground. Oil then expands at this point for a couple of seconds before it explodes. This can inflict fireblight, and if you get caught in the initial beam and get stuck in the oil, speaking from experience, you will almost certainly die. The after effects of the explosion have a huge range as well, and will also inflict fireblight. And I mean it they have a HUGE range. Gogu has an alternate orange beam attack where it’ll flick its head off to the side so the beam travels with it. This beam does a lot of damage, and also leaves a trail of oil in its weak which will explode almost immediately. In terms of physical attacks, Gogu can slam into the ground in front of it with its arms, similar to an attack from the Gore Magala. It can also slam its arm into the ground and spin, dragging its arm with it, and finish the attack with a flick of its tail. Getting hit by either the arm or the tail during this attack will result in damage. Sitting underneath Gogu is generally a pretty safe to be, as you tend to avoid the swiping and the beam attacks. Just keep a sharp eye on the oil dropping from its body, and for when it decides to charge across the map. Once Gogu loses a certain amount of its health (I’m not sure exactly how much), you’ll enter the second stage of the fight. You know when you’ve hit it because the music will change, smoke will start coming out of its body, and the monster will go batshit insane. The very first thing Gogu will do is leap into the air. The oil dripping from its body will explode a couple of seconds after it hits the ground, so if you get caught in it, you’ll end up taking a lot of damage. While in the air, it’ll shoot its orange beam all over the place in a random pattern that’s difficult to avoid. There are two ballista binders in this map, sitting opposite each other, and they have two levels of strength. My partner and I managed to bring Gogu down by hitting the binders at the same time when they were at their max strength, which both stopped its rampage and gave us some free hits. Gogu will remain in this more powerful form for the rest of the fight, with smoke coming out of its body and exploding oil dripping from it. When it’s dead, you get six carves from its carcass. That’s all there is to say about Gogmazios. This article rounds up my Beasts of Monster Hunter 4 Ultimate series of articles. I hope you’ve enjoyed them. I’ll likely do a similar series for the monsters found in Freedom Unite and 3 Ultimate, but for now, the semester’s about to start and I’d like a break from the weekly articles. Hope you’ve enjoyed the series, and keep checking back for more cool articles!